Powerful Aftershock Jars Kathmandu; Nepal Quake Toll Rises : The Two-Way A magnitude-6.7 aftershock rumbled the Nepalese capital and sent people running for open ground Sunday morning. 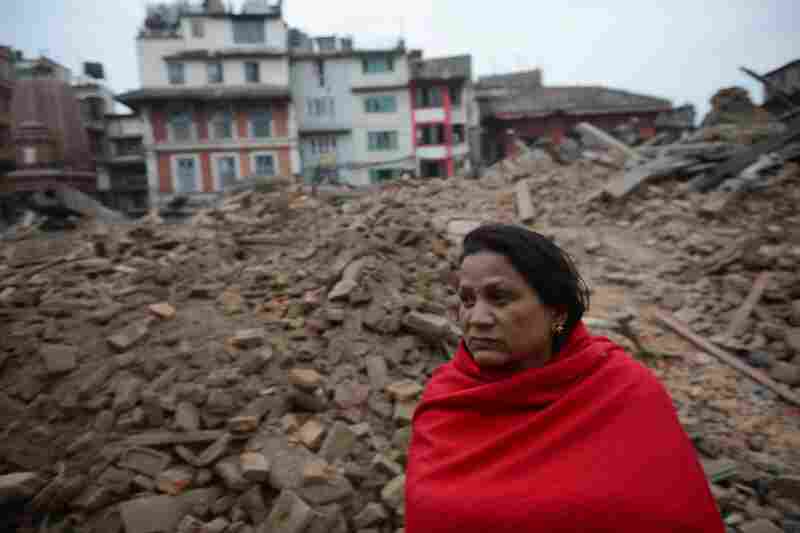 A Nepalese resident sits near buildings severely damaged by an earthquake on Kathmandu on Sunday. A Nepalese man cries as he walks through the earthquake debris in Bhaktapur, near Kathmandu, Nepal, Sunday. 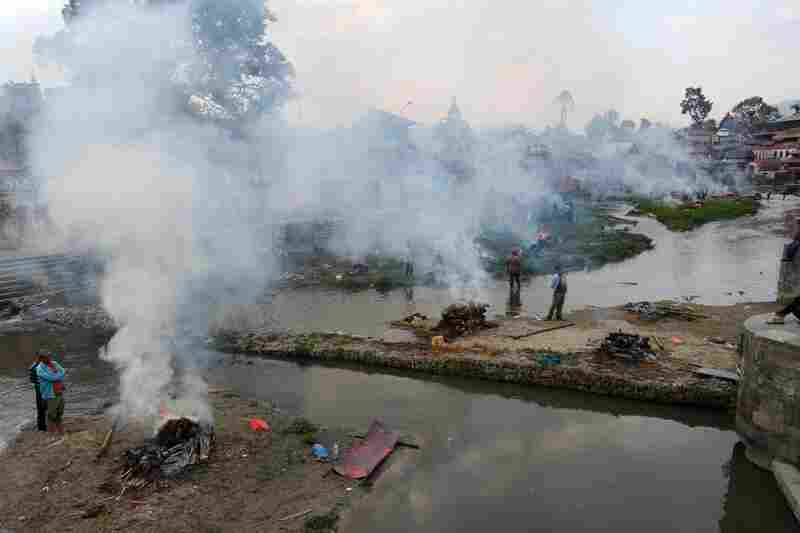 People burn the bodies of earthquake victims at a mass cremation at Pashupatinath in Kathmandu on Sunday. Rescue team personnel carry an injured person towards a waiting rescue helicopter at Everest Base Camp. 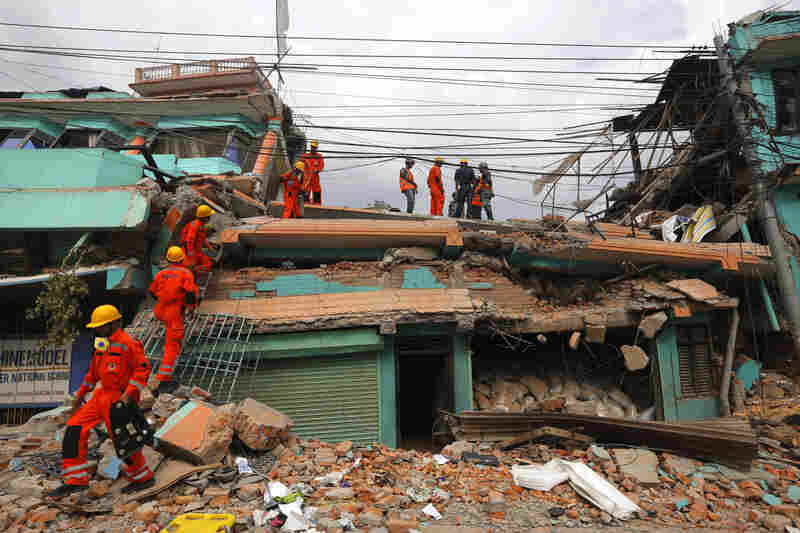 India's National Disaster Response Force personnel look for survivors in a building, in Kathmandu, Nepal on Sunday. 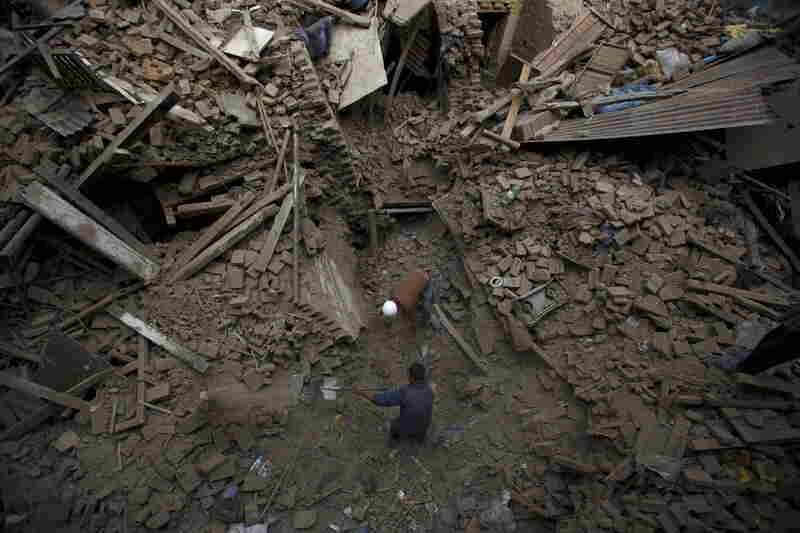 Rescue workers remove debris as they search for victims of earthquake in Bhaktapur, near Kathmandu, on Sunday. 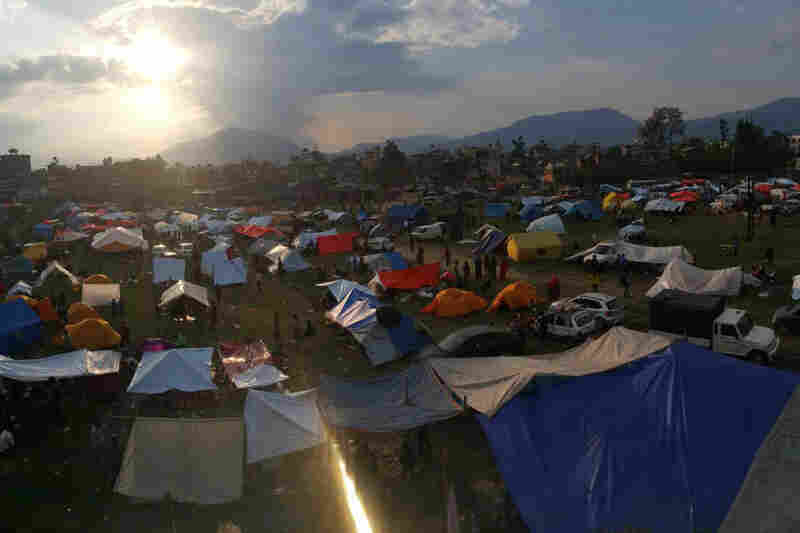 Nepalese residents set up tents in an open field at Chuchepati area in Kathmandu, Nepal. 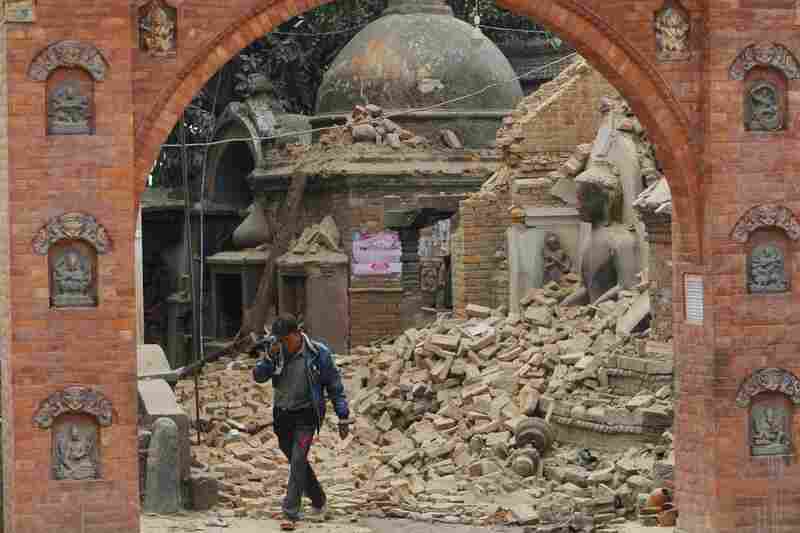 A magnitude-6.7 aftershock rumbled Kathmandu and sent people running for open ground Sunday morning, a day after a massive 7.8-magnitude earthquake ravaged Nepal and the region. The death toll from the disaster topped 3,000, a police official told Reuters. "Many of the people who had been too terrified to sleep in their own homes last night congregated in a series of mini tent cities around Kathmandu," Julie says. "When it struck, I didn't feel it right away, but I heard this roar of people around me rise in sheer panic shouting 'It's coming!' and they began running for their lives all over again," she said. The U.S. Geological Survey said the aftershock, the largest of numerous others rattling frightened residents, registered at a shallow depth of 6 miles. Minutes later, Nepal felt another aftershock measuring 5.0 in magnitude, says the Indian Express. At least three U.S. citizens are among the dead, the State Department said in a statement on Sunday. The total number of confirmed dead in Nepal was 2,430, with another 61 confirmed dead in India, and a handful of others in the Tibet region of China and Bangladesh. Saturday's quake was close to Mt. Everest, sending down new avalanches of snow and rock. "An earthquake that long set off avalanches all the way around us," Jon Reiter, an American mountaineer at the Napelese base camp, told CNN. "And they came down — they were large, they were massive avalanches." Rescue helicopters lifted the wounded from the slopes. 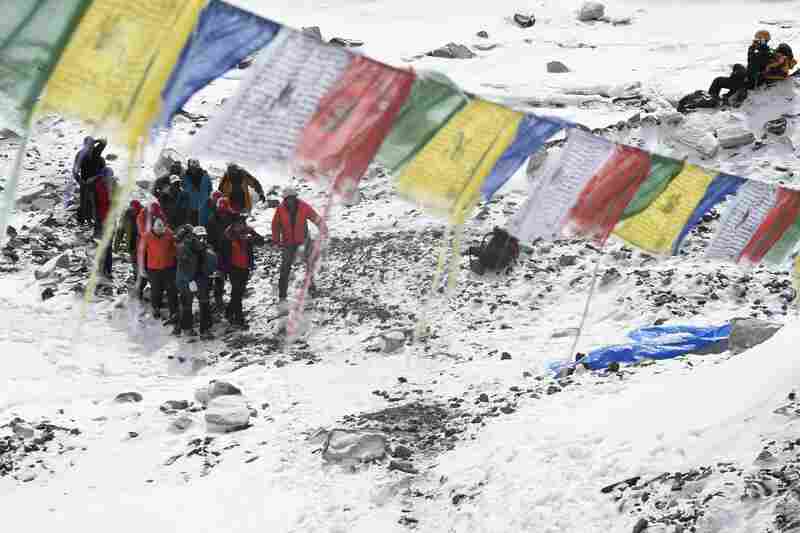 At least 17 people died at the base camp and 61 were injured, AP says. Rescues crews were dispatched from around the world to the region, but severed communications and landslides hindered the effort. India sent four planes carrying 450 disaster relief personnel, which reached the country Sunday. China dispatched a 62-member search team, reports the Wall Street Journal. A Pentagon statement said today that a U.S. military C-17 Globemaster departed Dover Air Force Base bound for Nepal. The giant transport was carrying 70 personnel including a USAID Disaster Assistance Response Team, the Fairfax County Urban Search and Rescue team and several journalists, as well as 45 square tons of cargo. It is expected to arrive in Kathmandu on Monday, the statement said. 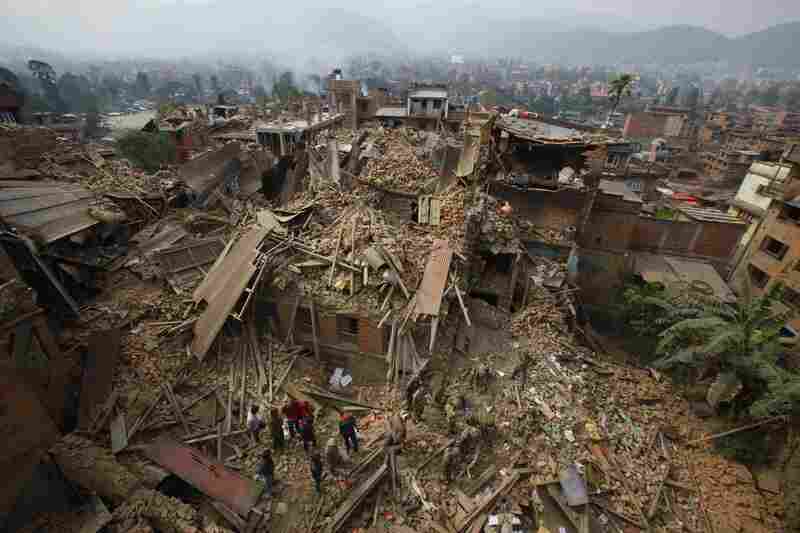 "As military helicopters hovered over Kathmandu and ferried relief supplies to victims of the earthquake in western Nepal, search and rescue efforts were going on in at least five locations in Kathmandu. "Near the prime minister's official residence, two bulldozers scoured the rubble of a flattened four-storey house. "A bystander said it was the local tax office. The bodies of the four staff inside had been recovered minutes before." The United States is giving $1 million in immediate assistance and preparing a response team, says CNN. Britain, Pakistan and European Union countries are among nations sending teams, said the BBC. In Kathmandu, tens of thousands endured freezing temperatures to sleep outside overnight for fear of further quake damage. Rescue workers and international aid teams started out at dawn to dig through rubble and debris in a desperate search for survivors. Hospitals struggled to cope with the wounded. Reuters quotes a paramedic who said Kathmandu's Bir Hospital had received 300 to 350 patients with severe injuries; most of them died, he said. "In the Kalanki neighborhood, police rescuers tried to extricate a man lying under a dead person, both of them buried beneath a pile of concrete slabs and iron beams. His family members stood nearby, crying and praying. "Police said the man's legs and hips were totally crushed.
" 'We are digging the debris around him, cutting through concrete and iron beams. We will be able to pull him out but his body under his waist is totally crushed. He is still alive and crying for help. We are going to save him,' said police officer Suresh Rai."